Ensure kids do not out colours in eyes. Do not let children use eggs. Make sure kids are using natural colours. In Holi, the unrestrained joy and free spirited indulgence in spraying colours at anyone that one can find is welcome for one day of the year. Parents are bound to be apprehensive about their kids in this case as they can do harm to themselves in the unbridled excitement of the festive spirit. You can take some steps to ensure your kids’ safety. On the day of Holi, before you and the kids get ready with your assortment of colours and spray machine (pichkari) to soak everyone in myriad of colours, pause! You should know what makes the colours you are so fond of. Red colour is mercury sulphite, purple has chromium and bromide compounds, copper sulphate makes green, and black is made from lead oxide. Their usage causes skin irritation, hair loss, allergies and even blindness in some extreme cases. It is better if you discourage the kids to use these chemical colours and get natural colours for them instead. Teach your kids to respect other person’s independence on Holi. Tell them not to be rude to the neighbours do not allow the neighbours to be rude. Ensure that the kids do not put the colours in their eyes or swallow the same. Prevent or instruct your kids to avoid running on wet floors as they can slip and get injured. 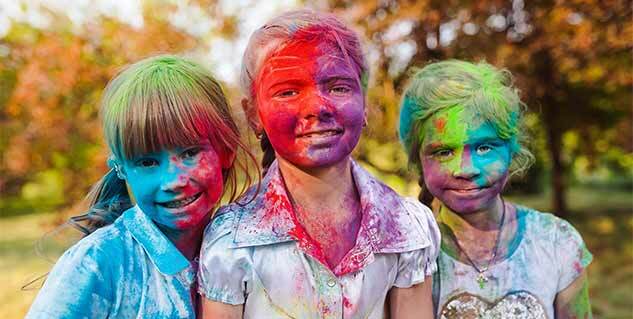 Do not allow your kids to use eggs, mud or gutter water on Holi. Never be casual about such unclean behaviour in festive celebrations. For kids who have acne, you should wash and clean their face and consult your doctor on the skin condition. Ensure your kids are using natural colours. You can also make skin friendly and herbal colours at home. Use turmeric, mehandi (henna) and beetroot for common colours. Add one tablespoon of haldi to 2 litres of water. Stir well. Boil to increase the colour’s concentration. Mix Gainda (Tagetus erecta) and Amaltas (Cassia fistula) flowers in water. Bring to boil and leave the solution overnight. Make a colour from henna by mixing 2 tablespoons in one litre of water. Stir Well. Green colour can be made by making a fine paste of leaves such as coriander (dhaniya), spinach (palak), tomato leaves, mint (pudina) and similar vegetables by mixing in water. 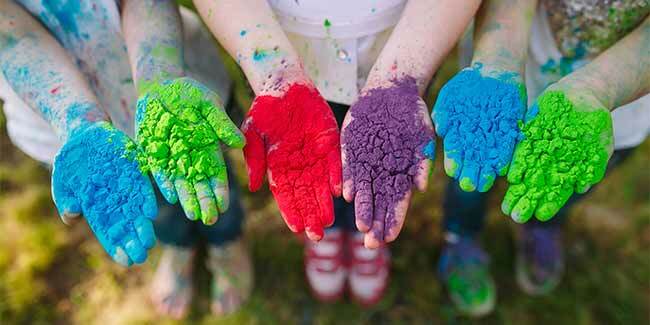 Follow these tips and try making natural colours at home for safe Holi for you and your kids.